Last week was a big week for the Viewfinders Photography Society. 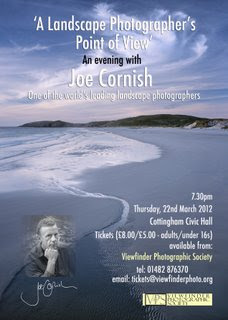 For the past year (or more, it seems) we have been planning an event of some magnitude and last week was zero hour - Joe Cornish came to town - Cottingham Civic Hall to be precise - for about three hours. Joe was the nicest guy, and gave a super talk to the sell out seated audience. I went mad and bought some raffle tickets (and won 7th prize) as well as buying one of the books Joe had on sale, which he kindly signed for me! So a top evening you have to agree.